Remote control of computers over the Internet. Instantly take control over a computer anywhere on the Internet, even through firewalls. No installation required, just use it fast and secure. Training, sales and teamwork. TeamViewer can also be used to present your desktop to a partner on the Internet. Show and share your software, PowerPoint presentations etc. File transfer, chat and more. Share your files, chat, switch the direction during a teamwork session, and a lot more is included in TeamViewer. TeamViewer 10 includes significant performance optimizations. CPU usage optimizations for multi-core processors, HD voice transmission quality, and faster login and load times for the Management Console are just a few examples. Apply setting policies, distribute them, and enforce them if necessary, all via the Management Console. Any changes to setting policies are automatically applied to all installations. IT Admins will be happy to know that importing .reg files is now a thing of the past. Permit access to all your devices using just one whitelist. No longer worry about having to grant users access via the whitelist on each specific device. Also reduce administrative work now by adding companies to the whitelist instead of having to manage access rights for individual users. Refer back to a previous discussion to find information or help resolve an issue. TeamViewer 10 provides a complete chat history for all conversations, and chats are end-to-end encrypted. Create persistent chat groups for ongoing discussions as well. Reach out to your colleagues using video and VoIP in exceptional quality for both image and audio without having to first start a meeting. See and talk to multiple participants simultaneously in a single call, and share your screen at any time. 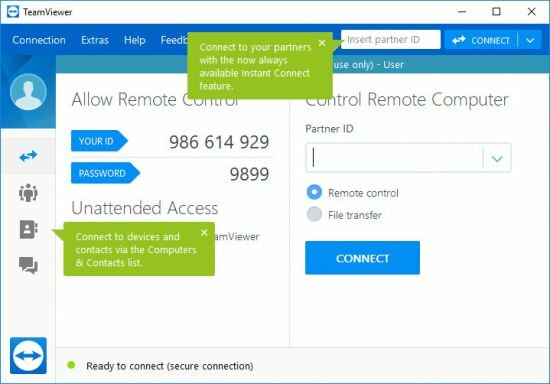 As always, security is paramount to TeamViewer, so video calls are end-to-end encrypted just as regular screen sharing meetings are. Put a face to your name and a personal touch to your online presence. Your profile picture is displayed in the Computers & Contacts list, chat window, request dialogs, and similar locations where it helps to identify you and add to your professional image. Quickly find the right person or device with whom or which to share your screen or files. TeamViewer 10 now automatically displays nearby computers and contacts. Ultra high definition monitors, also known as 4K displays, are becoming increasingly popular because of their incredible image fidelity. By means of intelligent scaling, TeamViewer 10 provides flawless connections to 4K displays for both remote control and meeting sessions. Customizations are now applied to the download site for the custom modules as well as the waiting room for meetings and service cases. This gives your corporate identity a more prominent presence. Maintain a protocol during a remote control session, or note something when it comes to mind. There is no need to wait until the end of a session to write comments. Modern software should look the part. TeamViewer 10 boasts a streamlined design and convenient new shortcuts to commonly used features and options. TeamViewer’s already intuitive interface is now even easier to use. Integrate your computers and contacts into any software by taking advantage of the Computers & Contacts API. See, for example, when your customers are online, and establish a connection to them from within your software. Synchronize information, and easily access, manage, and edit your computers and contacts. With user-definable session timeout limits, supporters and their clients never have to worry about idle sessions remaining open. Set up spontaneous support in addition to unattended access. Users can request spontaneous support that automatically generates a service case. There is no need to run a different module. Share files during meetings or remote control sessions by using Dropbox, Google Drive, OneDrive, or Box. Have your files available to share from wherever you are. With your data already in the cloud, you save both time and bandwidth. Do some final prep work before unlocking the door, or encourage participants to be on time by locking the door after starting a meeting. Don’t worry though, you can always see who is waiting outside and invite them to join. The whiteboard is now available during remote control. After all, a picture really can be worth a thousand words when trying to explain something. Both sides of the connection are able to use the whiteboard simultaneously as well. Transfer files in both directions. Enjoy the highest security standards: 256 Bit AES Session Encoding, 2048 Bit RSA Key Exchange. Benefit from a seamlessly integrated remote control toolbar specifically designed for Mac OS X Yosemite. Use Linux computers to provide mobile device support to the ever increasing number of mobile devices under your care.